Audrey Sheetz is an associate in Herrick’s Litigation Department, where she focuses on a wide range of issues that arise in complex commercial and sports litigation. As a member of Herrick’s Sports Law Group, Audrey has represented leagues, owners, professional teams and other interests in several notable cases. In May 2018, Audrey was a member of a New York State Bar Association panel which examined the U.S. Supreme Court’s decision in Murphy v. NCAA, and the impact of legalized sports betting on the industry. 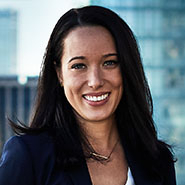 Audrey also has experience representing real estate development and construction clients in complex leasing disputes, purchase and sale agreement disputes, management and operating agreement disputes and litigation related concerns. Audrey is a member of the firm’s pro bono committee and is a passionate contributor to the International Refugee Assistance Project, which advocates for the legal and human rights of refugees, and Sanctuary for Families, which advocates for victims of domestic and gender violence in New York. In 2017, she received the firm’s Hon. Milton Mollen Pro Bono Award, which is given each year to a Herrick lawyer who displays an exceptional commitment to pro bono service. While in law school, Audrey served as a student prosecutor with the United States Attorney’s Office, Eastern District of New York, and as a legal intern with the United States Attorney’s Office, Southern District of New York and the Kings County District Attorney’s Office, and at CBS Sports Network. She was also highly involved in public service organizations, for which she was presented the BLS Platinum Award for Public Service.